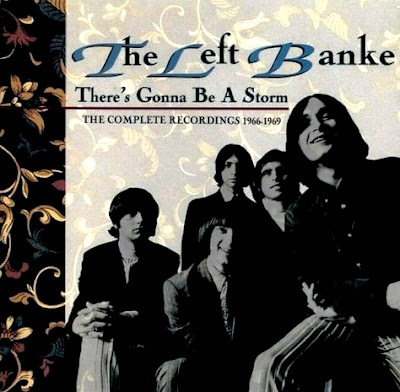 Brown resurfaced soon after with line-up of The Left Banke, although on their debut 45 Walk Away Renee, which appeared on Smash in July 1966 and eventually made it into the Top Ten in November that year, Harry Lookofsky made use of session musicians. The song was later covered by The Four Tops giving them a massive U.K. hit. It seems that the musical abilities of some group members were rather dubious. After the follow-up, Pretty Ballerina, had also made the Top 20, the band began work on their debut album. Around this time Jeff Winfield was replaced by Rick Brand, a talented guitarist and songwriter. The album was a successful vehicle for Michael Brown's songwriting talents, his father's production skills (making use as it did of studio techniques and session musicians) and Steve Martin's haunting vocals. It's a very consistent album and, aside from the first two singles, it featured several other gems notably Shadows Breaking Over My Head, She May Call You Up Tonight and I've Got Something On My Mind, It's rather sad, therefore that the group subsequently collapsed when Michael Brown announced he wanted to experiment and compose in the studio and wouldn't tour with the band anymore. Hereafter, the band's history becomes rather complex with both the remaining four members and Brown (who'd put together claiming the name. Brown and Tom Feher penned another lovely song, Ivy Ivy, which was released as a follow-up 45 and later withdrawn when the other four band members demanded that radio stations boycott the disk. She May Call You Up Tonight was released instead, neither 45 made any commercial impression. An attempted reconcilation took place in September 1967 and another Brown/Feher composition Desiree was issued in the hope of relaunching the group. However, radio stations tended to steer clear of it and the anticipated commerical comeback just did not happen. At this point Brown quit the group but the remaining members soldiered on producing a brace of good 45s:- Dark Is The Bark, Goodbye Holly and Bryant Hotel - which came nearer to the 'group' sound as opposed to orchestrated backing that Brand and the other remaining members wanted. They also released a further album, Too, which suffered overall from Brown's absence but matched their earlier effort in its finest moments (particularly with There's A Storm Coming). It was generally ignored and after just one further 45, Myrah (which has become the band's rarest 45), the band (by now a trio) gave up the ghost, shelving plans for a projected third album with just one cut left in the can. Brown went on to form Montage in 1969, which was really another vehicle for his songwriting and production skills and later he formed Stories (in 1972) and The Beckies (in 1976). More recently, circa 1998, he was responsible or producing / engineering / songwriting and providing keyboards on Yvonne Vitale's On This Moment CD. Sadly, the album, on the aptly named "Endangered" record label, was quickly withdrawn and less than 200 copies are thought to have survived. Bert Sommer became an actor in the Broadway production of "Hair", had a minor hit single with We're All Playing In The Same Band in 1970, and died of liver failure on July 23 1990.